Gen Xers may remember author Tony Wilson’s particular brand of humour from the ABCs fantastic travel documentary program Race Around the World. Since that time Wilson has penned a number of novels, is a regular columnist, has done radio and television and also found the time to write five children’s books. If you like bedtime stories to be hilariously funny with a gentle ‘message’, Wilson ‘s books will hit the mark. 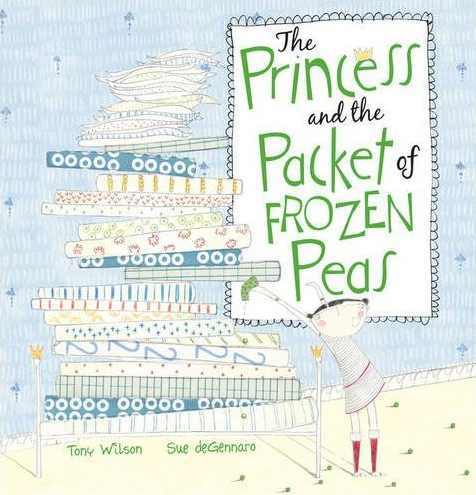 Wilson’s most recent children’s book is The Princess and the Packet of Frozen Peas. The story is a take on the Hans Christian Andersen classic, The Princess and the Pea, and came about when Wilson decided that sensitivity to a tiny pea under twenty mattresses probably made the princess a bit of a whiner. Prince Henrik comes up with his own test – instead of twenty mattresses there was just one thin camping mattress. Instead of twenty eiderdowns there was one old sleeping bag. Instead of a single pea there was a whole packet of frozen peas. Lots of potential princesses fail the frozen peas test until Henrik’s old school chum Pippa comes to stay – has Henrik found an “unreal princess”? Wilson’s fabulously funny story is perfectly complimented by Sue deGennaro‘s brilliant illustrations. The scowling Princess Eva, the somewhat meek Prince Hans and the very jolly Henrik and Pippa are spot on. The flat, two-dimensional drawings give the characters a certain jauntiness and the illustrations of Pippa limbering up for hockey and Henrik pitching a tent are good examples. I love this book for lots of reasons – I like to laugh with the kids, I like a fairytale that doesn’t make me cringe on the inside as I’m reading it and I like the fact that Pippa is authentic and likeable as opposed to helpless and simpering. Bring on more princesses like Pippa! The Princess and the Packet of Frozen Peas is available at Fishpond for $16.99. Also check out Wilson’s other children’s books including a favourite at our house, Harry Highpants.